Flash Thompson "yeah, I wouldn' wanna fight me neither" Dept. Indulge Dr. D and his Mainframe one more Echo Box to catch up against the 50-comment thread.. then spend one post while he mourns the crushing of the Yankees' enemies, watches us driven before them, and hears the lamentations of our women... then I s'pose it'll be back to our actual feebleminded shtick. Wondering the same thing. It's been another fairly long period. Hope again that he's okay. M's send: some 2019 cash for Myers (?! confused here). Oh, OK, $20M to equalize the entire trade for 2019 which isn't tough because Myers only MAKES $5.5M next season. Gotcha. Oh, ok. I get it. We kinda pay SD to take Leake, while re-imagining Healy and Segura off of Servais' chapped backside. Dr. D's reaction to this is that Segura must be a "Manny being Manny" bat who doesn't always completely fulfil his quota of SLG'ing .600. This whole "re-imagination" thing sounds more and more like a way to sell the suits on a one-way tix out of town for Jean-Jean the Hit Machine. He must have messed up and big time, I guess. At this point nothing else is making the Mainframe's fractions cancel. A fat load of re-imagination taking place to achieve this one addition by subtraction, wouldncha say? In the current climate, no way I see them both sticking around in 2019. Diaz is a huge prize for anyone seeking to compete next season. Calling Diaz a "huge prize" is a little bit like calling Drew Brees an "excellent quarterback." I'm trying to recall what the Yankees gave up for TWO MONTHS of Aroldis Chapman. 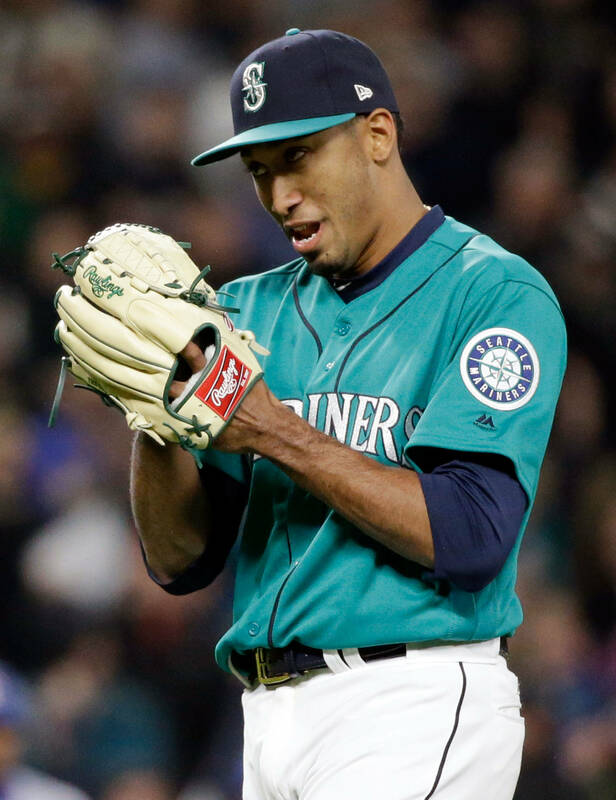 Trading off Edwin Diaz would represent, um, 15 times that amount of service. So what, pray tell, would be 15 times the prospects? Most fortunately Dipoto is re-imagining a roster WITH Diaz ("the kind of player we're trying to ACQUIRE) and Dr. D dearly hopes and Alex Colome stays. The last little bit of "wow factor" for 2019 would the Twin Closers, which are a chuckle, chortle and belly laugh every game in which the PROSPECT of their use comes into view. Well, that and Marc-O, to see whether that changeup falls off in velo any further. Too many bleepin' 1B/DH cooks! Far too valuable to ship off CHEAP for attitude issues. Not so valuable as to keep around under ANY circumstances. Ship him off, if you must... just make sure we get paid - in talent, not dollars. Same way I felt about Pax (to which... 'meh' to the results), same way I feel about Diaz (RP volatility is real and his return SHOULD transform our system), same way I feel about Colome, same way I feel about everyone not named Haniger or Gonzales (and you could win me over on either if determined... but I'd miss Haniger more than anyone). King, well said! I hope we're not proposing to bundle Cano and DIaz just to hide the lousy return that [Cano + Cano's contract] might produce. That said- I'm concerned, now, that if we trade all of last year's starting lineup, and rotation... our roster in Tacoma didn't look all that awe-inspiring, or intimidating, as I recall! Cano + Diaz to the Mets for their 3rd and 4th best prospects apparently gaining steam. I will await details and analysis before going ballistic. But the ideal scenario here is Diaz traded fro FULL prospect value, and Cano traded separately. I am opposed to ONE PENNY of salary relief for Cano being counted against the value of players we're shipping out... which of course is completely unavoidable in a combined trade scenario. The early reports never include the whole story. And perhaps I needed a reminder of that, even as I'm paying lip service to it throughout my (undiminished) concerns over the direction of the initial rumors, and the very concept of packaging Cano with Diaz. This COULD end up an overall good thing, or at the very least a reasonably defensible and not horrible thing. I've been a JeDi fan since before he was an Ex-Angel. Trading Diaz to move Cano would end all that. Just forget about moving Cano. We need his bat. Maybe it is uncharitable to assume that JeDi would trade our best pitcher just to save money. ...as you say, his bat plays well in T-Mobile Place Where Baseball is Played. BUT. I'm not averse to M's FO trying to save a bit of cash in the anticipated non-competitive year(s), assuming A.) they dish it back out when we ARE competitive, and B.) they don't give up talent acquisition opportunities in order to trim the payroll. And I'm not strictly opposed to the theory that Cano will only decline in value from here on out. Send Cano off if you must. Eat enough of the deal to get a prospect back, ideally... or just enough to ship him off w/o a return. Make it make sense. Just don't... don't!... use Diaz to pay down Cano's contract. (Now, that said... if the team taking on Cano has an interesting long-term 2B option you acquire in return... the calculus COULD change). We're going to give someone Diaz in order to eat Cano's contract? I have no hope of understanding this. As Doc sez (welcome home, Big Fella!!!) Diaz is exactly the kind of player we hope prospects can become, but he's ours already and he's already become. What the heck is going on? And what's the deal with sheddintg salary anyhow? The franchise is extremely profitable and about to become even more so. Cano is still an elite player. It makes no sense to move him for salary relief. And it makes even less sense to move him so that Dee (ain't OBPing) Gordon can play 2nd. I had a hard enough time giving up Pax for one good and two ok prospects. If they actually go through with this plus moving Segura, I'm moving, too. Involuntary manslaughter is one thing. Suicide is quite another. Would be very pleased if any trade involving the Mets has Thomas Szapucki as part of the return. I'm getting some nice, possibly more dominating, Steven Matz vibes there. Should be recovered and ready to roll for 2019! Hopefully a healthier outcome going forward than Matz. If we get a MLB 2B in any Cano trade, then Gordon isn't our 2B next season. So where do we ship him? DiPoto has indicated he's shooting for '21, but I still think we can do that AND field a competitive team in '19. If you trade Segura (who I love, but think he must have really POed Servais and DiPoto), then you save about $60M over 5 years. That is about what you would save if you trade Cano and pay off 1/2 his salary. An arb- controlled Diaz would be a nice thing to have in '21, when DiPoto hopes to be competitive. Trade Dee Gordon and you save another $28M over three years. Although we won't get much in return, I fear. But trading Segura AND Gordon saves $88M (minus any FA you may sign to replace Segura at SS). That's a lot more than the savings of a Cano trade, assuming we eat 1/2 his salary. With a Seager bounceback and real production at 1B, we're competitive AND less salary encumbered down the line. Didn't think there was any anger left in me towards the M's way of running their franchise into the ground. The Cano+Diaz for junk rumors are starting to trigger it. It could be that the backdrop on all this is the fact that this is the time of year the M's are pushing season ticket sales. Then it could determine a lot of what eventually happens. I've been evaluating these rumors based solely on the impact to the product on the field. I was concerned about moves to ship players off to [somewhere] for a bucket of balls, simply because they didn't get along with the owner, the GM, the manager, or this week's favorite. I wasn't translating anyone's presence on the roster into ticket sales! I'm afraid I'm one of these folks who roots for the Mariners (my childhood team) from afar, in the depths of New England. So, I have little sense of who's popular and who's not. (YOu don't get that from the box score, or even on the radio!) Is Robbie really perceived as a cheat? Is Dee the fun guy who puts bums in seats? Is Jean Segura on the outs because he doesn't get along with the fanmaker? I was thinking the fans came to see Zunino and Paxton. Clearly not! But- if we trade Robbie, and Sugar, and Segura- who's gonna be left? Are the fans gonna turn up to watch (former) King Felix throw to David Freitas?! but I'm pretty sure they take that feedback into account. It still seems to me the Mariners could maximize the return on each of Robbie and Sugar by auctioning them off, individually. They seem to have found a willing buyer for Robbie in the Mets, owing to the priorities of their new GM, RC"s former agent. It's unclear to me how the inclusion of Sugar in the deal makes the overall return bigger. Perhaps the Mets have told the M's they will give Seattle salary relief on Cano only if they include Sugar. I'd like to call their bluff, and see what happens if the M's entertain offers for Sugar, independently. I'm sure they can ask for teams' first and second top prospects, some "can't miss" guys who would immmediately transform our farm. I'm not a fan of waiting, because I'm not sure Sugar ever has another season like 2018. All that said- if the Mets include Peterson, Dunn, McNeil and Kelenick, I'd even take back a few bloated contracts (Bruce, Swarzick, Vargas) in return for Robbie and Sugar. Can report this more definitively: As of now, the not-yet- official Mets Mariners trade on the table is Cano/Diaz for Bruce/Swarzak/Kelenic/McNeil/Dunn Medicals have not been reviewed. Remember Wilmers’ tears. ...color me intrigued. I dont care what the M's pay $-wise in an off-year. I like that talent package, from an uneducated perspective. Quite a bit. Is Swarzak fixable? His K/9 was still good last year... I wonder if he's a fix-em-up and trade at the deadline candidate? ...I *may* owe JeDi an apology for lack of faith. Still, being underwhelmed by the Pax return, I feel some hesitation is warranted. I've got to admit it's getting better! Mets fans are up in arms about seeing Kelenic go. Less so, but still concerned about losing McNeil. Me? I think I'm OK with the parameters as outlined here (Cano, Sugar out; Bruce, Swarzick, McNeil, Dunn, Kelenic coming back to us). Kelenic was the guy I wanted from last June's draft. He's critical for me. McNeil would replace Cano at 2B- he also sounds like a really good get. Bruce, Swarzick are dead weight, unless (somehow) the Mariners can turn them around. Dunn? Lotsa potential- ahead of Swanson. Jerry- if this is true- I commend you! You found the one place on earth that values Cano above all others, and you're getting a decent return from a contract you inherited and never wanted! In the immortal words of the Samuel Jackson's Chief Engineer of Jurrasic Park, "Hold onto your butts!" This is going down possibly tonight with news coming out tomorrow. I agree the most recent updates on who's included and hints that two Mets salary dumps are included seem to validate the wisdom of the deal. Looks like the trade may not go down until later today, and possibly no announcement today. I'm hoping the M's are holding out for the best possible prospect haul. If they are taking back two bad contracts from the Mets, though they admittedly only mitigate Cano's bloated deal, it should help the prospect haul. If you read Mets' fans comments on MLB Trade Rumours or twitter posts, they are bemoaning this deal. I think the perception out there undersells the value Cano will bring. Certainly Bruce will provide little or no value to the M's, so the contracts they are taking on are for worthless players. Cano is not at all worthless. He has good value as a player, it's just his contract that hurts both in amount and in years. I'd much rather have a plus player with a bad contract than a minus player with one. I still figure the M's are gonna hang on to the salary relief and not spend it, either now or in the future. We have enough history with them to know their game. Jeff McNeil hit .345 vs RHP last season, courtesy of a .378 vR BABIP. Yet he had an average exit velocity of 85.2 MPH. Span’s was 86.5 and Gamel’s 88.7. McNeil did OPS .812 vs LHP, with a BABIP of .300. That is sustainable. His vR numbers are not. Which doesn’t mean that he is chopped liver....but he isn’t going to be the hitter he was last season. And we have no real use for Jay Bruce, except as a DH. Edit: Several rumors now have Gerson Bautista, relief pitcher, as in the deal with McNeil now out. Bautista got rocked at every level, including the bigs, last season. Several sites say the Mets are considering non-tendering d'Arnaud. The Ms need a catcher - I wonder why he's not part of this. And the other guy I liked (Jordan Patterson, a tall, lanky LH 1B/OF) was put through waivers and picked up by the Reds. We hope Evan White makes any other 1B prospect redundant, but.... this guy can play the OF, too., which Vogelbach cannot. I almost would rather have Cecchini or d'Arnaud than Bautista, also. But this is turning out not so bad. I did get Dunn right and expect him to develop into a nice member of the staff. I expect Bruce to be a DH and 5th OF. ...was too good to be true! Got beat up last year, but was considered by some to be the best of the several pitchers acquired by the Mets during their 2017 trade frenzy. Sounds like he was a bit rushed, and maybe didn't take the world by STORM like Diaz when converted from starter... but perhaps he just needs another year? I'd rather have NcNeil, but Bautista isn't NOTHING. I can see Jerry imagining him as Diaz in two years. Any possibility he chose Bautista INSTEAD of McNeil? If Gordon stays, second base is filled. And for that matter, if Gordon does stay, then he's potentially the double play partner of his old pal Segura? That would be interesting. The prospect haul better get a little heavier if $60M is going out the door. I was underwhelmed without the $60M included. Dunn puts lots of guys on base, even repeating a level WHIP was almost 1.3. Kelenic is supposed to be the uber-prospect of the deal but 19 at high rookie ball isn't terribly ahead of track and his performance there wasn't eye popping, with borderline concerning K issue. Next year even if he excels and gets to High-A at 20 years old appears nowhwere in the neighborhood of a Robles/Soto/Acuna kind of guy you should be shooting for or at least close to. Bautista is a wild lotto ticket Maikel Cleto type guy that most often does not pan out. Not feeling this return. Get Szapucki and/or Peterson in there. One of the M's beat reporters was saying 60 included the contracts returned as offsets. So practically, there's hope for more like 33+ contracts. And I kinda like the RP that's a one-year deal coming abck our way as an offset; he seems fixable and tradable to a contender at the deadline for soemthing shiny. ‘60 mil’ presently includes contracts received, confirmed. The Mets-Mariners deal, as @joelsherman1 said, won’t be done today and is likely to be pushed to Monday, sources told Yahoo Sports. The question is how much money Seattle sends to covers Robinson Canó’s contract, and sources say it’s likely to be in the mid-$20 million range.
. . . what's the point of the trade? That's half what he is owed. Plus what we would have to pay Bruce makes it even worse. Why not keep Cano, let him play for two or three more decent years then release him. Same cost but you got an elite hitter for the money and you get to keep your closer. Would anybody actually trade Diaz straight up for these prospects? Colome to White Sox for Omar Narvaez, LHB platoon catcher, prob'ly start most of our games. I like this move. The high-salaried Colome is useless to us at this point, and to fix the hole of a starting catcher, an anti-Zunino LHB platoon guy is a perfect get. He's high AVG and OBP vs RHP, and though he doesn't hit vs. LHP he does still get on base in that situation. The White Sox move is a good trade, maybe a great one, if his pitch framing improves. Daddy's right on. Here is where I'm beginning to differ with the projected Mets' trade: DiPoto has said that he's working on a timetable that has '21 as when we return to competitiveness. Yet the Mets move does nothing prospect-wise to help in '21, unless you think Kelenic is going to shoot through the low minors and essentially skip AA or AAA. McNeil's presence in any trade would change that, of course. If DiPoto is looking at the extra $12M that he will have to spend in '21 (Cano's salary minus a 50% buy out) then you have to ask will that $12M buy us something that makes a difference. Who needs closers when you're tanking! Translation - Breaking: They sent Robinson's Cano's agent to look for him; they're only waiting on the physical to make the trade official. Dollars confirmed: $20M plus contracts. Now just waiting on medicals and the commissioner‘s approval of mega bucks changing hands. So we save $64M. We also bet that we get more value from Kelenic, Dunn and Bautista than we do from 6 years of Díaz. And we bet that we can start spending that $64M on something valuable in ‘21. Now that it is done I am still not sure what to think of it. I do think we got played a bit by the Mets with a bait and switch on McNeil and I think DiPoto was too invested in this deal to walk away. Kelenic becoming a star, Dunn a multi-year #3 (or Díaz blowing an arm in ST due to an undiagnosed issue) makes it all worth it down the line. Keith, what makes you think the M's will actually spend the $64 million and not just pocket a significant part of it. If the rebuild doesn't go as quickly or as far as planned, and the team is not in serious postseason contention you can bet they will pocket not spend. Remember Johjima, not the Alamo. If they indeed trade Segura and Leake, once Felix' contract is up after next year they will be able to trim payroll down to the $90 million mark or lower. They can then spend $10-20 million and say their payroll is over the $100 million mark. Who is really driving the severity of this tear-down, DiPoto or the Committee? Midseason last year the Suits thought they had a Messiah in DiPoto and a postseason appearance was pretty much sewn up. But disaster struck after that, and their dreams of greatness worthy of the payroll were shattered. When reality hit, they told DiPoto to tear it down and get payroll down pronto. Granted this is a cynical hypothetical scenario that goes beyond the known facts. But I wouldn't put it past the M's given their track record. I mourn the case of perpetual Geoff Bakerism that plagues much of the M's fandom. The owners are cheap. Twas ever thus. But then how do you explain the Cano contract? The Felix, Seager and Segura extensions? The recent payrolls? I think it's time to face the reality. Spending hasn't been the problem. I think it's still true that no member of this ownership has taken even a penny out of the team to date. My concern is no matter how much money is in the bank in 21...there won't be anyone to take it. We will be the worst franchise in baseball, and no free agent will want to come here at any price. See the recent history of the Padres. If we don’t spend a decent part of it then it would indicate a lack of interest in winning when you said you would be interested. Ah, just now saw this comment. Apparently you have the same concern I do. I'll bet they pocket at least half of any payroll reduction. And by that I mean not just the next year or two, but going forward after that they will not turn around and invest all dollars saved in the interem on top of 2018 payroll levels. They will at best simply return to 2018 payroll levels. This will mean they will pocket the dollars saved in the interim. If we are aiming for ‘21, then selling Segura is folly. We don’t have a SS or 2B in the hopper that will be better than he is then. B-R has the best Age 28 comps for Segura as Craig Biggio, Barry Larkin and Jay Bell. Biggio’s two best seasons were are 31 and 32. At 31-34, Larkin had 4 of his best 5 seasons. In case you forgot, you can visit both those guys at Cooperstown. Jay Bell had 3 of his 4 best seasons at 31-33. His best season was at age 33. Alas, he’s not in the Hall. Raphael Furcal is Segura’s #5 batting comp. His best season at the plate was at age 32. TonyFernandez is #7, he had terrific seasons at age 36 & 37. Sharon Dunston is #8, he peaked at 32. You get the idea. Odds are that Segura keeps hitting for the next 5 years. ‘21 is just three seasons away. But somebody who won’t be here in ‘21, Servais or DiPoto, doesn’t like him. It appears we are interested in sending him to the Phillies for J.P. Crawford, who has hit .244-.343-.370 in two AAA seasons. He was -0.4 dWAR in 229 MLB SS innings last season. But he’s cheap and walks 105 points. And trading Segura means we can keep Gordon. Oh, goody. I can get my arms around the Cano-Díaz trade, if we invest the savings when the time comes. Trading Segura away, just to save his salary, is a putrid idea. ...if we trade him away for Crawford, we better get something better than/similar to Crawford in return as well. Someone like Luis Garcia (Phi 18y/o SS, not the Phi P) would be an amazing add-on if we insist on moving Segura. Pure hitter, low K's. Played all this past season at age 17. Improved each month. Excellent prospect! Crawford is flat out horrible. His contact rate is abysmal, and when he does make contact, it's three times as likely to be hit in the air as on the ground. Think Gordon, but significatly worse. The Phillies don't have the prospects to make this deal make sense no matter who they offer. This is the deal that ownership should veto If it goes through, JD will have lost me forever.